Grow flowers from a flower! Give your guests a bouquet of flowers as a beautiful memory of your special day. All they need to do is plant the seed paper flower on these plantable wedding favors, and enjoy the wildflowers they will grow. Personalize the plantable favor with your details and choose the color that best matches your wedding theme. Printed with both cocoa brown and matching colourful ink. 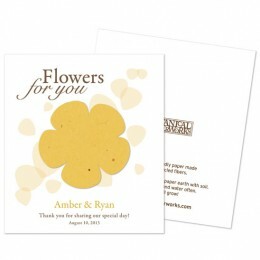 Consider ordering a mailing envelope with your plantable wedding favors. Envelopes measure 5 1/4 x 4 1/4 inches and take regular postage. You must order a minimum of 20 favors.